......is the North's history in a microcosm. By portraying John and Rika, key figures of early Alaska, the North's development may be more clearly understood. Through one hundred, beautifully-rendered, archival photographs, and the appealing lay-out of the well-researched text, the story is easy reading. Rika's Roadhouse, a lodge built at Big Delta in 1914, was the hub of civilization between Fairbanks and the Canadian border between 1904 and 1942. John Hajdukovich, a Yugoslavian, and the builder of Rika's, was the law, a trader and the life support system to the Natives of the Upper Tanana River. Hajdukovich was the force behind the Tetlin Reserve and was also at that time the Interior's most competent big game guide. Sparking the Interior's infrastructure, and numerous businesses, Hajdukovich was a father of today's Tanana River Valley economy. Parallel Destinies has been acclaimed by the Arctic Bibliographer and Rare Books Curator, University of Alaska, Rasmuson Library; the head of the Interior's State Parks; the purchaser for Alaska Gateway School District; Barnes and Noble; world-published author, Mihajlo Mihajlov; various Fairbanks Daily News-Miner editors; book store and art gallery owners, here, and in the Yukon and Northwest Territories. Destinies, an excellent Christmas gift, helps resident and visitor alike better understand the story of the North. Parallel Destinies is followed by Blue Hills, Alaska's Promised Land, the published tales of the Ferguson family in the Alaska Bush. Destinies was printed in Yugoslavia. The spectacular photographs are printed on imported, high-gloss paper. Author Judy Ferguson has built on a special historic connection, the mystique between Alaska and the Slavic East by portraying the parallel destinies of the Balkans and Alaska, the Last Frontier. 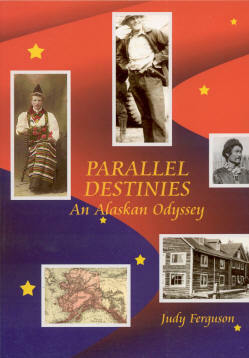 Parallel Destinies sells for $19.95 direct from Judy Ferguson and from many Alaska and Canadian booksellers. The 3rd edition, published April 2005, ISBN: 0-9716044-0-1 is distributed by Voice of Alaska Publishing and by News Group. It is available online from the Outdoors Alaska on-line store.